Peace Pit BBQ, of Greeley, improved over last year’s reserve champion finish to take top honors in the 2012 Colorado State BBQ Championship at Craig. Pictured here, clockwise, are Mark, Susan, Destiny and Mary Jo Shook. • Pit Barrel Cooker Co. The Colorado State BBQ Championship at Craig is an event that has managed to exceed expectations of its annual competitors for the past three years. It’s a contest Bob Sammons, of Oops BBQ in Grand Junction, said epitomizes the spirit of fair play in the “sport” of competitive barbecue cooking. A lot of credit for the atmosphere, Sammons and wife Louise said, is due to the Craig and Moffat County community, which has embraced the BBQ championship as evidenced by the partnership this year with the Moffat County Balloon Festival. The Colorado State BBQ Championship at Craig, a Kansas City Barbecue Society-sanctioned event, attracted 35 competitors from all over the country, its largest field to date, and more than 3,550 spectators during the course of the two-day cook-off Friday and Saturday at Loudy-Simpson Park. At one point early Saturday morning, one of Sammons’ generators shorted out. He hadn’t noticed his electric smoke distributor stopped functioning until informed by a neighboring competitor who also offered Sammons a spare outlet in his recreational vehicle. That spirit was further evidenced Saturday afternoon during the awards ceremony where each finalist in the categories of chicken, ribs, pork and brisket received medals and trophies to congratulatory handshakes from other teams in the field. But, one team in particular stood out from the rest. 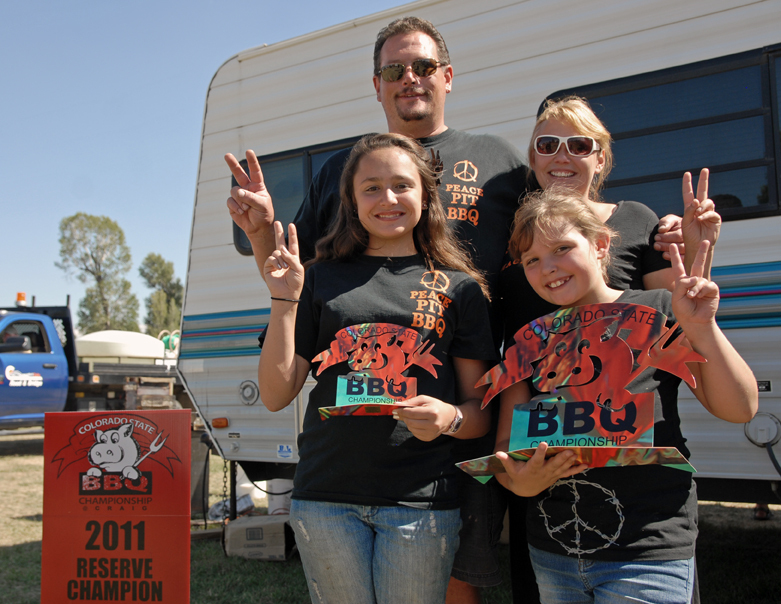 Mark, Susan, Destiny and Mary Jo Shook, of Peace Pit BBQ in Greeley, finished fourth in the chicken and ribs categories, and took first place in pork. When they were announced as the overall grand champion, the Shook family had to navigate its way through a standing ovation and a sea of high fives and hugs from the other teams in the field. Peace Pit took home reserve champion honors in 2011 and edged out Team Enoserv by 5/10s of a point to earn the top spot in 2012. Though happy to see one of the event’s annual competitors crest that hurdle to win the Colorado State BBQ Championship, George Rohrich, an event organizer and chief executive officer of The Memorial Hospital in Craig, said he was pleased to see the competitors and the community make another contribution to a worthy cause. As part of the event the cookers donated a “truck load” of meat to St. Michael’s Community Kitchen. Spectators added an additional 500 pieces of canned and dried food goods, plus close to $500 in cash.